The idea between the nuclear bazooka was fairly simple: it was a very short range tactical nuclear weapon that can be used by troops at the front line against fast approaching enemy troops. Weapons like the Davy Crockett (US Army) and Wee Gwen (British Army) were designed in the 1950s as a way of halting Soviet ground forces and buy time for NATO to regroup. 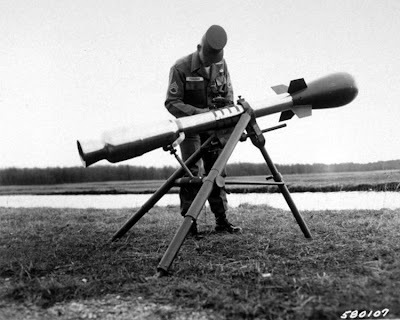 Davy Crockett was a nuclear recoiless rifle projectile with a range between 2-4km. Obviously the nuclear warhead of such a device had to be very small otherwise it would be destroy the defenders too. Davy Crockett had at it's core the W54 warhead which was the smallest ever produced by the US. The warhead had a yield of between 10-20 tons of TNT (0.01-0.02 kilotons) but a major part of the weapon's effect was the radiation produced that would leave the area of impact uninhabitable for 48 hours. As such it was one of the first neutron bombs though the term was not used at the time. This radiation hazard proved even more important when the weapon was tested and found to be highly inaccurate. Anything 400m from the blast was likely to receive a fatal dose of radiation even at the lowest yield setting though 550m was considered the minimum safe distance for friendly troops. The margins were a bit tight though as 500m would cause sterility and a lack of co-ordination. Contrary to myth the blast radius was not greater than the range of the weapon so it was not a suicide weapon, in fact the blast radius could be as small as 200m. Davy Crockett was used by the US Army between 1961 and 1971. The British Wee Gwen never entered service, it was very controversial with the Army who considered weapons like it and the Davy Crockett unsound because of the difficulties it would create with command and control. The inaccuracy was the main problem with the Davy Crockett, because the blast radius of the weapon was small it was likely the defenders would have to fire a lot of the weapons to try and halt a determined mass Soviet attack. The further the projectile was fired (and thus safer to defending soldiers) the more inaccurate it got too... Well you see the problem there. Because of the inaccuracy troops would have to fire more against concentrations of the enemy to try and ensure a hit and lets just say there were cheaper warheads they could have fired. Never mind less hazardous! Like many "toys" from the Cold War, we should just all be thankful the Davy Crockett was never used.